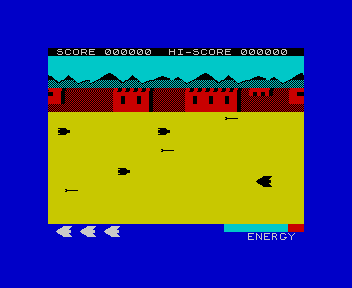 Viper III © 1984 Mastertronic, Ltd. The evil Quardons have attacked the peaceful planet of Nimea. You have been commissioned to take your squadron and rescue the stricken inhabitants. Having travelled far to save this troubled land you are low on fuel and need all your skill and concentration to manoeuvre safely through the attacking Quardons, using lazer fire only when necessary. Try to pick up the fleeing Nimean refugees, whilst destroying the Quardon's base defences. Once you have made it through, search for fuel in order to continue your mission.